The American Library' (2018). Hardback books, Dutch wax printed cotton textile, gold foiled names, headphones, interactive application. Installation view at The Cleveland Public Library. © Yinka Shonibare CBE (RA). Courtesy James Cohan Gallery, New York and FRONT International: Cleveland Triennial for Contemporary Art with funds from VIA Art Fund. Photo ©Field Studio 2018. Libraries are mostly known to house books, but beyond that they are home to endless stories. British-Nigerian artist Yinka Shonibare CBE (RA)‘s latest exhibition, “American Library,” explores historical and personal immigration narratives of the United States. The immersive installation is on view at Louisville, Kentucky’s Speed Art Museum and is a collaboration with 21c Museum Hotels; it’s co-curated by Miranda Lash, Curator of Contemporary Art at the Speed Art Museum, and 21c Museum Hotels Chief Curator and Museum Director, Alice Gray Stites. ). Life-size fiberglass mannequin, Dutch wax printed cotton, mixed media. Collection of Laura Lee Brown and Steve Wilson, 21c Museum Hotels, and Collection of Jim Gray. This expansive exhibit, which lives inside what was once the library room of the Speed Art Museum, is comprised of 6,000 volumes covered in Shonibare’s signature Dutch wax fabric. The rich fabrics envelope each book as a visual symbol of historical migration, trade, slavery and colonization; the cloths are most commonly associated with West Africa but were transported from Indonesia by Dutch colonizers. On the spine of each book, embossed in gold, are the names of figures that have for better or worse influenced the American public dialogue on immigration—immigrants, first-generation Americans, and people who have spoken out against immigration, equality, and diversity in the United States. Notables include: John Lennon, Cesar Chavez, Anaïs Nin, Joshua Kushner, Toni Morrison, Donald Trump, and Drake. And while the word ‘immigrant’ usually connotes people migrating from other countries, Shonibare thoughtfully includes immigration within the United States. Featured with the aforementioned are the names of African-Americans who relocated or whose parents relocated out of the American South during the Great Migration. Figures pivotal in the forced migrations of Native peoples are also included. 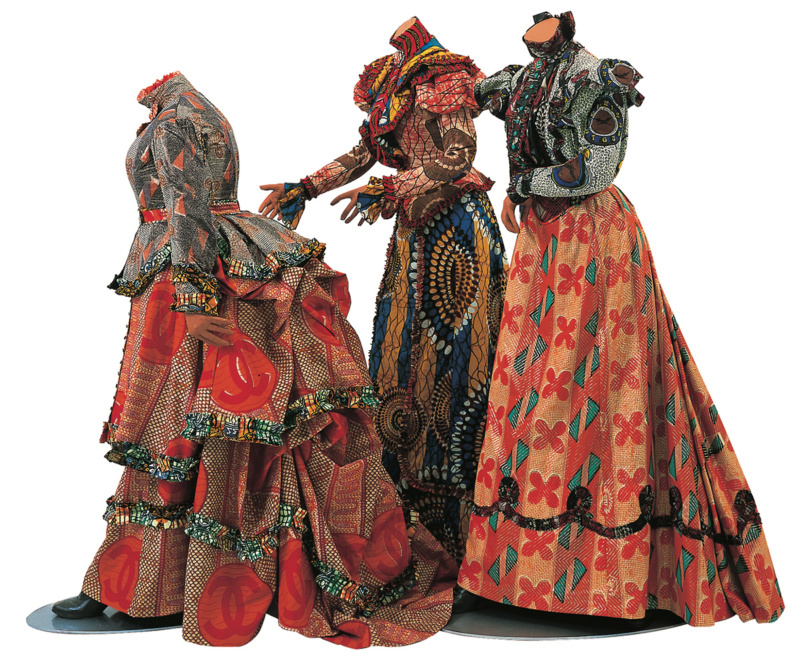 Yinka Shonibare, CBEB, Three Graces (2001). Printed cotton textile, three fiberglass mannequins, three aluminum bases. Purchased with funds from the Alice Speed Stoll Accessions Trust 2002.6 a‑c. Shonibare’s other major works are included: The Three Graces, The Age of Enlightenment — Gabrielle Émilie Le Tonnelier de Breteuil, Marquise du Châtelet, Food Faerie, and the Sleep of Reason Produces Monsters, all of which explore themes of race, class, cultural identity, and the political and economic relationship between Africa and Europe, giving neophytes more context and seasoned spectators more to feast on. Using supplemental elements, curators Lash and Stites maximize on the opportunity to create community through the museum experience. Partnering with the Kentucky Refugee Ministries, refugees translated the overview text into the Spanish, Arabic, Somali, Nepalese and English, the five most populous languages in Louisville. Throughout the show’s run, the museum will host several community-driven events, the most seminal being a Naturalization Ceremony, celebrating new citizenship for 100 immigrants in Louisville. Kentucky may seem like an unlikely place to explore immigration, but 21c Museum Hotels and the Speed Art Museum are using their instituitional power to shape the cultural landscape and perhaps heal an ugly past by creating a new, more inclusive narrative. With the United States recent immigration rhetoric reaching a climactic crescendo, Yinka Shinobare’s “American Library” provides a much-needed objective look at America’s ever-evolving immigration story. 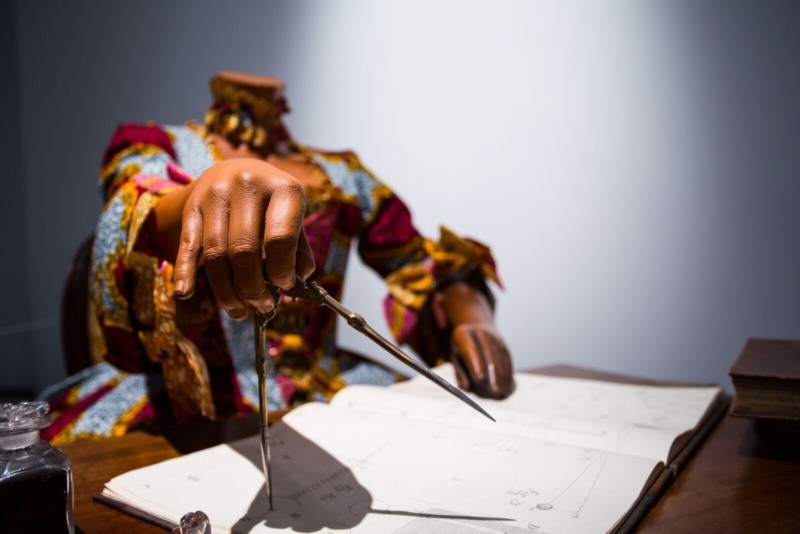 Yinka Shonibare CBE: The American Library is on view at the Speed Art Museum through September 15, 2019.